Summary: Grooming is an essential task that won’t just only keep your pitbull clean, but safe from infection and disease. Pitbulls like to be cleaned and cared for. Fortunately for you, bathing them shouldn’t pose too much of an issue if you get them accustomed to it at a young age. Now, you can essentially shower your pitbull as often as you’d like, but be sure that you use a mild pet shampoo and rinse him thoroughly. As little as you’d enjoy being bathed in ice-cold water, your pitbull feels the same. 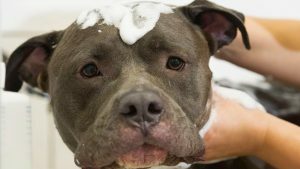 Rather than taking him outside and hosing him down, use an attachment in a tub or a sink – unpleasantly cold or hot water will only make your pitbull resist every time you want to shower him. It should be noted that the sooner you get your pitbull accustomed to nail trimming, the easier it will be for you in the long run. In any case, it should be introduced as soon as you bring him home – as soon as you bring home those XXL pitbull puppies for sale, get them prepared for grooming. Trimming is an essential grooming process because overgrown nails can deform the foot, break off, and cause an infection. By handling his paws on a daily basis, you’ll be able to desensitize him. Iron King Kennels, the pitbull specialists, can help you find the perfect pitbull companion for your household. Be sure that you’re cautious about trimming each nail though. Clip the tip, rather than a large chunk as you’re likely to skim a vein and cause bleeding and discomfort. This process should be done weekly to make sure your pitbull doesn’t take offense and withdraw his paws every time you touch them. Remember, it’s essential that you get him accustomed to it a young age.